Grapeland and its school system were founded when the railroad came into Houston County in 1872. The first school in Grapeland was an old log schoolhouse located where the Baptist Church now stands. It was a one-room, one-teacher school and served the community until 1892 when a new two-room frame building was constructed on College Street. In 1912 fire destroyed that building and a new brick school plant was completed in 1914 at the site of the present high school. A complete rebuilding program was launched in the 1950s and by 1956, Grapeland Elementary School was in operation north of the high school. There was a new high school, a new W.R. Banks School and a new auditorium, which was named for speech and drama teacher Lorena Shoultz. In April 1960, the gymnasium burned but was replaced by a more modern structure. The new auditorium burned in 1964 to be replaced by an identical building that stands today. The passage of the bond issue last year (2006) will fund new facilities and renovate existing campuses at the high school and elementary school. 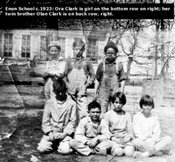 The known schools that were consolidated to make the present Grapeland School District are Cedar Branch, Daily or Daly, Enon, Germany, Hammons, Hays Springs, Juanita, Livelyville, Mt. Zion, New Prospect, New Salem, Percilla, Raymond, Rock Hill, San Pedro and Woodland Hall. Grapeland ISD serves about 500 students in grades pre-k through 12th and employs about 100 administrators, teachers and staff.